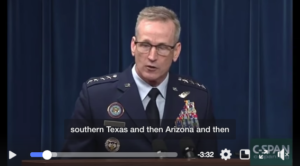 Listen to this scary-assed Pentagon guy describe the military build-up on the southern US border as if they were expecting hordes of armed thrill killers infected with the bubonic plague to be rushing the border at any moment. The Honduras/Guatemala caravan of several thousand men, women & children are farmers, working people, refugees, not criminals & they are not bearing arms. When you hear the plans laid out here for militarizing the border, it becomes clear just how threatening this is not only to the young mothers & little kids presently seeking asylum or to the caravan but to the entire system of democracy in this country. If they can do this to families seeking asylum, they can do this to the Black, Latino, & Native American communities, to striking workers, & peaceful protesters. This is a call to arms. What is needed is massive mobilizations all over this country, all over the world, & at the border itself demanding immigrant & refugee rights & free & safe passage to all. No human being is alien to us. “I don’t recall the last time when so many old rich white dudes were so afraid of so few young & poor brown people. This is a member of an ambulance crew in Gaza crying over the recent deaths of several Palestinian children by snipers & bombers. Medical personnel are unsung heroes in war, occupation, & genocide. 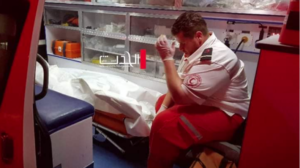 Though against international law, it is routine that the US, Russia, Syria, Israel, India target medical personnel, including firing on or bombing ambulances & medical facilities. When pellet gun victims in Kashmir or Israeli sniper victims in Gaza are brought to hospital, it is these medical practitioners who must deal in trauma care as on a battlefield. The PTSD levels among them must be sky-high. Many have themselves been killed. We should take a moment to honor these men & women & note that they are also on the front lines of the Great Return March in Gaza & frequently protest against pellet munitions, against the occupation, & in solidarity with other freedom struggles in Kashmir. A video too grotesque to share is circulating on social media of a Syrian army soldier throwing lighter fluid on a yelping dog & setting it on fire because it barked at his girlfriend. Meanwhile Assadists like Bartlett & Beeley are denouncing asylum for White Helmet rescue workers who would receive far worse treatment than that suffering dog if they were to stay in Syria. 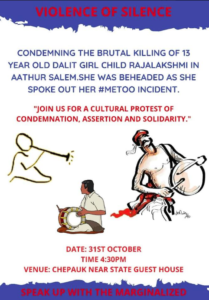 This protest in India is in defense of a 13-year-old Dalit girl named Rajalakshmi who was beheaded by an upper caste neighbor when she spoke out against his sexual advances. As this article explains, he was enraged that a little girl from an oppressed lower caste would dare spurn his grotesque pedophiliac assault. MeToo cost a child her precious life. The MeToo movement has only just begun–under the promptings of women oppressed by war, occupation, genocide, caste, class, & now this little girl–to broaden the scope of its inquisition. It’s too late for this small child but we must memorialize her life & her courage by investigating & exposing the essential role of sexual violence in caste oppression. May little Rajalakshmi Rest In Peace & Power. Kashmiri journalist Ajaz Dar is in hospital after being injured by pellet munitions while he was covering an encounter with the Indian occupying army. Is shooting pellet guns at journalists another case of getting caught in crossfire? 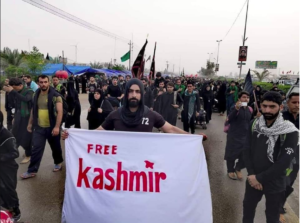 Iraqis under US military occupation for over 15 years stand in solidarity with Kashmiris under Indian military occupation for nearly three decades. US out of Iraq! India out of Kashmir! Since the Pittsburgh gunman was a Christian, where are the all the demands that Christians around the world denounce & disassociate from his actions? Or is such a spectacle of contrition only operative when the gunman is a Muslim? But of course Netanyahu congratulated Bolsonaro. They’re made of the same stuff politically. What’s important to evaluate is why extremist right wingers are winning elections around the world (is the electorate moving right or are most elections as rigged as they are in the US?) & what that represents. The only effective countervailing power against this rightward shift—whatever it represents—is independent, massive political action against war, occupation, genocide, inequality & for human & democratic rights. 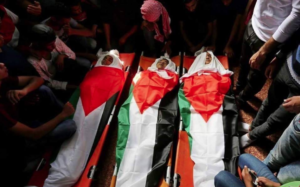 Where are the candlelight vigils, where is the mourning for these Palestinian children? Are they not human too?